One of my “nap shows” (shows I allegedly watch on television when I am napping) is “Dual Survival,” a show that features two survivalists of vastly different temperaments, who try to survive in extreme temperaments while they are trying not to kill one another. This season was so traumatic for the survivalists that the one I like, barefooted hippie Cody Lundin, only made it through three episodes before being booted off the series due to reasons we viewers will probably never know. But one of the three shows that did make it to air showed him and his co-survivalist cringing as a hooded cobra reared up at them and threatened to strike. This brought up fond memories of my younger days as zoo reporter for the Salt Lake City Deseret News. I once wrote an article about the process of devenomizing snakes. If you’re not familiar with this little piece of surgery, devenomization is the same thing as a vasectomy, except that the snake’s “business end” is up in his head, where the venom is. The surgeon ties off the tubes in two places, cuts the tubes between the ties, and ostensibly the snake is no longer able to inject venom into potential victims. I do not know whether this surgery is even performed in these enlightened days when animals are considered to be more important than humans. It was, however, performed when I was a zoo reporter, and this was the subject of my article. When I met the man I was interviewing, he took me into a windowless room the size of my current office. This room was filled from floor to ceiling on all four walls with tiny cages of poisonous snakes. If you can name a poisonous snake, there was at least one in this room. Bushmaster. Black mamba. Fer-de-lance. Death adder. Blue krait. Taipan. Eastern brown snake. Tiger snake. This place was a regular Hotel o’ Serpents. I was super impressed, and I was even more impressed when the man I was interviewing (I would mention his name if I could remember it), pulled a five-foot cobra from its cage, dropped it on the floor, looked up at me, and smiled. Without the photographer, it was the herpetologist, the snake, and I against the world. It was not lost on me that the cobra had its own built-in cheering section. Every last one of the several dozen poisonous serpents in that room was rooting for the cobra, and I knew it. It was quite possible that the herpetologist was on the cobra’s side too. The herpetologist talked to me as the cobra reared up, spread its hood, and hissed. 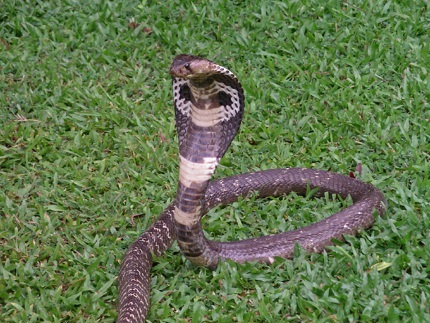 I could see the little eyeglasses on the snake’s hood from the front, alerting me that he was a king cobra. King cobra. You can see a pattern that I think of as a pair of eyeglasses that are on the back, but that come through to the front of the hood. © iStock 2014. All rights reserved. Used by permission. Like a good little reporter (I must have been all of 22 years old at the time), I took frantic notes so I wouldn’t miss a word. That’s exactly the effect the cobra on television had achieved on the “Dual Survival dudes,” with the operative word being scared. Yes. I had noticed that. When a cobra strikes at you, you tend to notice it. (I can vouch for this from first-hand experience.) It had missed my leg by about six inches on the side. I was glad to notice that the herpetologist was at least watching what the cobra was doing. It made me feel tons and tons more secure. “He missed me on purpose?” I said. This was a big relief, because by now the cobra had struck at me three times. Once it had missed my left leg, once it had missed my right leg, and once it had gone right between them. I kept right on taking notes. “There are two more things the cobra can do,” said the herpetologist. “He really does not want to use those fangs unless he has to, and even if he uses those fangs he does not want to give up that venom. The next thing he does is he’ll knock his mouth against your body, but without opening his mouth. Up until now, the cobra had cooperatively demonstrated the things that the herpetologist had talked about. I am pleased to report that the snake lost interest in the demonstration at this point. It did not give me the mock bite without opening its mouth. “The last thing the cobra can do,” said the herpetologist, “is that he can actually bite you, but without inserting any venom. It’s a nasty bite, but it won’t kill you. I stopped writing for a minute. “I assume this cobra has been devenomed,” I said. He picked up the snake with a metal hook and put it back in its cage. I continued the interview without batting an eye and went off in search of my photographer. It was a whale of a story, if I do say so myself. But without any artwork whatsoever to illustrate it, it was not published for at least eighteen months. I was so embarrassed that I did not show my face at the zoo ever again, which was one of the nails in the coffin of my Deseret News writing career. You see, I never explained to any of my editors why I never returned to the zoo. Bad mistake. Nevertheless, I think of the cobra incident occasionally. I enjoyed the whole thing — except for the aftermath, of course. I really enjoyed being the zoo reporter, and I only wish I’d had the courage to explain to the zookeeper why I was no longer visiting the zoo and writing zoo-related stories for him. He probably would have thought I was an absolute idiot — which, of course, I was. I learned several lessons from watching the behavior of this particular cobra. The first thing a cobra does when it is confronted by a potential predator is to rise up, make itself look big and threatening, and hiss. What I learned from that is that we need to face the world with an air of confidence. This is always important, but it is especially important when we are feeling insecure. Criminals who prey on women have been interviewed in prisons, and they freely admit that they look for victims who look afraid. They look for women who are cowering, who are clutching their purses tightly, and who telegraph by their body language that they are in fear of attack. These are the very women, criminals say, that are the best victims. Yes, they are the ones who expect to be victimized, but their expectations do not protect them. On the contrary, their expectations tell predators that these women are weak and afraid. Women who appear to be strong and confident are less likely to be victimized because they will put up more of a fight. The next thing a cobra does when it feels threatened is to strike out. This tells us not to sit around and do nothing. Human beings need to strike out and make our move in the world. We will never accomplish anything if we sit around and do nothing. 1 Chronicles 22:16 says, “Arise therefore, and be doing, and the LORD be with thee.” I have always liked that verse. If we’re doing — and I always believe the “doing” is assumed to be doing righteous things — we will have the company of the Lord. The cobra’s next tactic is to knock against the predator with a closed mouth. This tells us to knock on every door of opportunity. This has always been a hard one for me. I have been given numerous brilliant ideas throughout my life, but I do not have the gift of persistence. I tap on the door, but when the door doesn’t immediately open, I shrug my shoulders and walk away. Time and time again I have been given ideas or opportunities that have required only a little bit of persistence, but I have failed to follow through. I have never learned that lesson. One idea came to me in 1973, when my car overheated in Death Valley. I longed for a can or a bottle of cool, clear water. I fantasized about cans or bottles of water that could be purchased just like soft drinks. Who needs a soft drink when water is the ultimate thirst quencher? At the time there was a free source of water in my home town of Mandeville, Louisiana. There was an artesian well that came out of the ground at the beach and was there for anyone to drink. It was the best water I’d ever tasted. That was the name of the water I wanted to bottle — Artesia. Evian did not reach the U.S. market for another five years. And even then, it was carbonated. It was a different product altogether. If only I had persisted, I might have had a completely different financial history instead of being a starving writer for all my life. That might have been a good thing, or it might have been my undoing. I’ll never know. As a last resort, cobras bite without venom. This teaches me that when you have to correct someone, do it without venom. You don’t have to scar people for life, and in fact people learn their lessons far more effectively if the lessons are taught kindly. One of my earliest memories occurred when I was sitting in the neighbors’ yard, trying to keep their pet cat on my lap while I was pulling its tail. As you can imagine, the cat was not happy about this arrangement. The mother of the house saw what I was doing and quickly came outside. Instead of paddling me as most of the mothers in the neighborhood would have done, she gently showed me that petting the cat would have far happier results for both the cat and for me than pulling its tail. Sure enough, once I petted the cat instead of pulling its tail, the cat was happy to stay in my lap. I never forgot the lesson or the gentle way it was taught. When the cobra has no other possible action, it bites. From that I have learned to defend yourself when you must. There’s a big difference between making excuses and defending yourself. If I had gone to the zoo director and just given him a copy of the story I had written, he would have seen I was not a slacker. I could have continued writing zoo articles without embarrassment. A few years later, I possibly would not have lost my job with the Deseret News. My lack of performance as a zoo reporter was a big factor there. Defending myself is one lesson I know intellectually but have never really internalized. If I live another twenty years, I am still going to have trouble defending myself if defending myself is needed. We all have lessons that are just about impossible for us to learn. That is one of my stumbling blocks. It always has been. But that doesn’t mean I can’t stop trying. That’s one thing about life. There are lessons everywhere if you look for them. Everything you do can inspire you to be a better person, if that is what you’re trying to do. If course, if you’re a lazy sort, there’s always something interesting on cable TV.